Between the thrill of the Spring Classics to the majesty of the Grand Tours, it's easy to forget the dangers associated with bicycle racing. Unfortunately, today in the third stage of the Giro d'Italia, we were reminded of those dangers in the most tragic way. 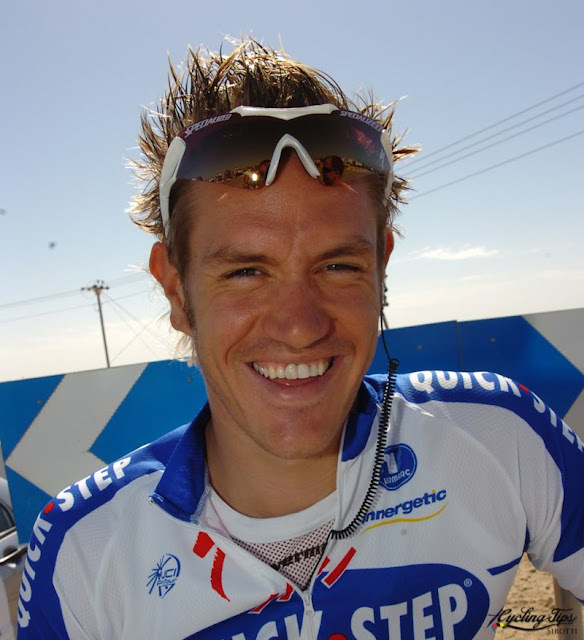 Wouter Weylandt was born in Ghent, Belgium on Spetember 27th, 1984. He first tasted success in the U23 ranks as a junior member with Quick Step, the highlight of which was a victory at the U23 Tour of Flanders. As he progressed at Quick Step, he showed great form in the spring classics, and was instrumental in Tom Boonen's pair of victories at Paris-Roubaix. By all accounts, Wouter was friendly, well liked, and a model domestique: selfless and always willing to sacrifice his own result for the good of his team and team leader. Individually, Wouter also claimed victory in Ronde van het Groene Hart as well as stages in Ronde van Belgie, Driedaagse van West-Vlaanderen, and the Vuelta Espana, among others. In 2011 he signed on with the new Leopard Trek team, following his breakout 2010 which saw him win Stage 3 of the Giro d'Italia. It's ironic, then, that it was the exact same stage that claimed his life today. By eyewitness accounts, Wouter was looking over his shoulder while trying to bridge back to the peloton during the descent down Passo Del Bocco, about 25km from the finish when he clipped his left side against a small wall and was launched from his bicycle, falling some 60 feet to the road below. Despite almost immediate medical attention, he died soon after at the scene. While it's easy to begin assigning blame, we should remember that Wouter was a sprinter, and as such, one of the best bike handlers in the world. What happened to him was an accident. I don't know if it was a moment's inattention by Wouter or a particularly dangerous route by the race organizers. Perhaps we'll understand better tomorrow or perhaps we'll never know. Personally, I don't think it really matters. Determining fault won't bring back one of the most promising young riders of the peloton, nor will it remove the inherent danger of our sport. Wouter knew of and accepted the immense risks involved every time he clipped into his pedals, yet, that did not dissuade him from pursuing a sport he loved. He should serve as an inspiration to all of us. Cycling is dangerous, but it is also beautiful, and connects to us in a way no other sport can. Tomorrow, go for a ride in memory of Wouter. Ride safe, of course, but ride hard. Find the biggest hill you can and climb it as hard as you can, until your legs and lungs burn and your shoulders shake from the effort. And when you collapse back down on your saddle, grimacing from exertion and gasping for breath, be thankful that you still have the opportunity to enjoy the simple pleasure of riding a bicycle. That, I think, is what Wouter would want. Wouter Weylandt is survived by his girlfriend, who is expecting the couple first child in September. My thoughts and wishes go out to Wouter's friends and family.